9. Artas: Call to Action! 13. Nablus: IOF Snipers Evicted! 16. Nablus: What Could Happen Next? 19. Is This Ben Gurion Or Hell? 22. Jerusalem: ICAHD Continues to Rebuild! On the morning of July 19, 2007, the Israeli occupation force invaded the village of Zawata just north of the city of Nablus [see previous ISM reports here and here]. The army proceeded to demolish the house of Asad Natoor. Moving deeper into the village, the force besieged another home and proceeded to destroy the external walls while “interrogating” an individual inside. Human rights activists arrived to the scene alongside medics – attempting to halt the destruction. The Israeli Army blocked the entrance of an ambulance called for a pregnant woman. The army used force to repell human rights observers from the first home demolition. Upon the arrival of human rights legal observer, the army openly admitted they had no demolition order. Furthermore, the District Command Office (DCO) continually ignored calls. When officials from B’tselem (Israeli Human Rights Organization) inquired as to the presence of a demolition – the civil authorities indicated they weren’t aware of the operation. Soldiers then assaulted the human rights workers requesting documentation and authorization from the soldiers. Zawata: Witness to Israeli War Crimes is a short documentary covering the events of this day. It includes extensive interviews from the victims of that day and film of the soldiers who committed these crimes. However even then we were not allowed to remove the wood because we were told it would look like we were trying to steal it. We began then to cut and collect the grass to take to the goats so they could eat. The police soon showed up, followed later by border police. They kept a heavy presence near us but did nothing to stop the harassment of the settlers. This harassment of course escalated, starting with shouted insults. When international volunteers brought this to the attention of the police, they were told that unless this was caught on film there was nothing they could do. Even with this warning, the police still did nothing to deescalate the harassment from the settlers. The family then let their goats out to eat the grass that grows on the land they own and this proved to be the last straw for the settlers. An old, well dressed settler exited his settlement using a stick as a walking aid, and giving the impression of frailty asked one of the volunteers where they were from in an aggressive manor and suddenly without provocation attacked two international human rights workers with what proved to be a spiked stick. He first hit one female volunteer across the head, moving on to strike multiple blows to another this time male observer. His arm was left bleeding heavily, leaving blood on both he and the settler. The police had no choice, in the face of such obvious lawless aggression and knowing that of course this time it would be filmed, but to intervene. They ran up the stairs and prevented the old man from returning to his settlement, and arrested him. The two HRWs and the man who filmed them were taken to the police station, and the old man was arrested. The Palestinians and HRWs were told that the area had to be cleared because the situation was “heated”. The Palestinians and volunteers therefore left the land of the family only to watch Israeli settlers exit the settlement, walk freely through land and socialize with the military and police. After a few minutes spending at the police station the attacking settler was eventually released by the police with the explanation that they are not going to arrest Israelis during shabbat. At approximately 7.30 pm on Wednesday 25th July, three international human rights workers (HRWs) maintaining a presence in Susiya – a Palestinian farming community located in the South Hebron Hills – were called to assist two Palestinians who had been detained on Route 317 at the highway junction next to the illegal settlement of Susiya. On arriving at the junction, the internationals filmed the situation, noting the number of the army vehicle and spoke to the two Palestinians, who were being kept away from their car at the side of the road. From what the internationals could gather, they had been stopped because they were ‘Arabs driving a car with Israeli license plates. Coincidentally and at the same time, the internationals and the local Palestinian who had driven them to the scene noticed Israeli settlers working in the field opposite junction. Upon speaking to the local Palestinian it was discovered that this land belongs to several Palestinians living in Yatta, a nearby town, who had all the documents needed to prove their ownership. About a month and a half ago, settlers were found working on the land and were building a pipeline in order to irrigate it. After formally lodging a complaint with the local police, the settlers were told to vacate and discontinue their work there. They have since been caught a further four times working in the same area. The HWRs recorded approximately ten settlers in the field and called a Christian Peace-Making Team (CPT) worker to the scene, in order to further document this violation of police orders. At approximately 8.10 pm, many of the land owners arrived from Yatta. The CPT worker talked with the police, lodging yet another complaint, whilst the internationals continued to monitor the settlers and obstruct their view as they attempted to photograph the Palestinian land owners. Negotiations with the police – a Palestinian-Israeli police officer in particular, continued until around 9.30 pm at which point the police informed the group that ‘everything had been resolved’ and they could all go home. 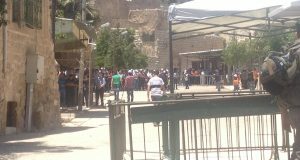 The Palestinian and international party however decided to stay until the settlers had left which was at around 10.00 pm. This situation highlights once again the violation of international law which Israel continues to uphold. Not only are settlements illegal under article 49 of the Fourth Geneva Convention – “The Occupying Power shall not deport or transfer parts of its own civilian population into the territory it occupies” but additionally, in July 2004, the International Court of Justice ruled that the occupation, the Wall and the Israeli settlements were all in violation of international law and must therefore be ended. The existence of such law however means nothing if it is not upheld accordingly. July 25th, 2007. Palestinians, International Human Rights Workers and Israelis recently went to the village of Wadi Rahul, which is near Bethlehem, to document a number of Israeli settlers that intended to initiate a new illegal settlement on a hill beyond the Efrata Settlement on Palestinian land. It is understood that this was their second attempt and on this occasion they have sought to assemble a large number of people through the internet, inviting people throughout Israel and the settlements. We received information of the hour and the place of where they would leave, on foot since the police organized numerous “check-points” to intercept them. However the Settlers had sufficient information to avoid these meaningless preventative measures and were able to access the land. Towards 16:30 we divided into two groups to be able to observe from two farmers homes which hill the Settlers wished to occupy. It is understood that one of the farmers had been notified by the Israeli Occupation Forces (IOF) not to leave his property after 5pm. During the previous evening, the army and the police had implemented a gate along the road the Settlers wished to take. During the day this particular road had been filled with police and military vehicles, the number of which increased significantly during the build up to the event. Towards five in the afternoon, it was possible to see hundreds of Settlers begin marching towards the land they wished to occupy. They obviously hadn’t been dissuaded by the checkpoints or gates and had found suitable alternative routes to enable them to get to their chosen site. Shortly after, they appeared in a cultivated field, still walking. They formed a row and passed across a field in the direction of the hill they wished to occupy. They appeared to be walking in the middle of the fields to avoid interception by the police or the army. In the other location where activists were based to help protect Palestinians, it was also reported that Settlers had thrown rocks at the property and there had been an attempt to detain someone, however they were later released without harm. Originally we maintained our observation of events from the roof of the Palestinian home, however we moved to the outside of the house close to where the Settlers were passing to ensure they didn’t act unnecessarily aggressive. Whilst the Settlers trespassed onto Palestinian land, a few Settlers attempted to converse with the Palestinians however this was very much limited to stating that the Palestinains should leave as, “it is not their land”. A further Settler claimed that the land had been given to the Jews by God. The march continued toward the hill, where the police and the army were expecting them. At this point the Settlers scattered in many directions and the security forces were incapable of preventing the Settlers from passing around them to continue their march. It is worth noting that the soldiers made little effort to use the “crowd control” devices they tend to employ at Bil’in, on their own people. ie. sound grenades or tear gas. Among the participants there were people with backpacks and what appeared to be camping equipment, indicating the Settlers were likely to remain in place. It’s difficult to determine the exact number of Settlers that participated in this event due to the numbers being so dispersed across the hills, however it is estimated there were approximately 600 Settlers. The police managed to stop the march from passing before it arrived at the second hill which was on slightly higher ground. When an activist approached to see what was happening, it could be seen that many of the Settlers were beginning to return and had begun to leave the area. A number of buses appeared to remove the demonstrators from the land however many chose to leave on foot. Later HRWs returned to the house with the Palestinians, and we remained there to be able to cover possible aggressions later that evening by any remaining Settlers. Until well into the night, until at least 1am, many bus trips were made to remove the remaining Settlers from the area. There was a large military presence maintained and a significant attempt to remove determined Settlers who wished to stay on the Palestinian land. Throughout the night, soldiers, Settlers and Police continued to move throughout the surrounding fields, sometimes using flares to determine positions of each other and settlers. Even in the morning it was still possible to see Settlers remaining in the fields from the previous day. The Friendship and Solidarity Summer Camp that has taken place in the Tel Rumeida area of Hebron is unfortunately coming to a close. To celebrate what has been an amazing two weeks of fun and laughter, the participants would like to invite friends, activists and internationals to a final party. The party will be held at Qurdoba School on Shuhada Street, Tel Rumeida at 5pm. We hope that you all can come along and join in the celebrations for what has been a fantastic time for all involved. Approximately 300 international, Palestinian and Israeli non-violent demonstrators came together for the 129th Bilin demonstration against the illegal Apartheid wall. The demonstrators came from all backgrounds and included children as young as five through to women, men and elderly internationals, Israelis and Palestinians. The demonstration took a different route than usual and entered the olive groves from the far left hand side through a small road close to the wall. Upon entering the Olive groves, the soldiers almost immediately began firing tear gas canisters and sound grenades at the demonstrators who were peacefully walking towards the Apartheid wall. Despite demonstrators being hundreds of meters away from the Wall and not posing any threat to the soldiers or the Wall itself the soldiers used severe aggression without just cause. Demonstrators made significant attempts to avoid the tear gas however due to the direction of the wind, many of the demonstrators were severely affected by the gas, including one international male who required attention by the Palestinian Red Crescent. Despite initial attempts by the soldiers to disperse the demonstrators, the non-violent activists persevered in getting their message across that the Apartheid wall must fall and that the people of Bilin and the internationals say No to the Occupation. The peaceful demonstrators faced rubber bullets being fired seemingly without reason and in a completely indiscriminate manner, as well as tear gas canisters directly at demonstrators. It was only through great fortune that there were no reports of serious injury as a consequence. Due to the heat of the day and the excessive use of tear gas, fires were started within the Olive groves. Unfortunately due to the direction of the wind, a large fire took hold in a section of the groves and approximately ten Olive trees were severely burned and damaged. Demonstrators were keen to preserver the trees however the fire was too strong for them to overcome and they had to retreat. Due to the recent death within the village of a local Palestinian woman who died whilst giving birth, there was a conscious effort by organizers to reduce the length of the demonstration out of respect to the family and friends of the deceased. As such after approximately an hour, the organizers brought the demonstration to a close. July 24th, 2007. We have received a call for activists to go this evening to Wadi Rahul, close to Artas in the Bethlehem region. They are expecting hundreds of Israeli Settlers from the nearby settlements of Efrata to go there tomorrow in an attempt to occupy the land. It is expected that Settlers will arrive early tomorrow morning with caravans to take over the land. It appears there is support and collusion with the army and we expect there to be a large number of soldiers tomorrow “protecting” the settlers from the Palestinians. It is also reported, that there were members of the Israeli authorities implementing a gate to restrict access to the land. The gate is designed to prevent Palestinians from accessing their own land in the interests of Settlers being able to take the place over instead. Obviously, putting down caravans is the first step in establishing a permanent presence so it needs to be prevented. They are looking for as many internationals, Israeli’s and whoever will support them to go down, ideally tonight, to camp out as they believe the one and only road accessing the land will be closed by tomorrow, alternatively to come in the morning. However to make a serious attempt at preventing the settlers accessing the site, people need to go tonight if they are willing. Anyone who is available, please make an effort to go there this evening so we can try and stop the Illegal expansion of settlements in the West Bank and the grotesque thieving of Palestinian land. For more information please contact: Awad (059 890 7252) or Rose (054 224 9179). Saturday July 22nd, the Tel Rumeida Summer camp was to go on a field trip to the nearby villages of At-Tuwani and Qawawis. The theme of the summer camp is “solidarity and friendship,” and the purpose of this trip was to let the kids meet children from other villages and to learn about the similar problems they face both from the army and from the Israeli settlers. See this article for more info on that subject. Operation Dove, two international organizations both work in this village to document cases of harassment from settlers but are not allowed to actually intervene. There were about 20 bottles of water which we pretty much went through by the time we were ready to leave Tuwani and go to Qawawis, which was just down the road where the plan was to make and fly kites. figured out. Issa spoke to the commander in the jeep and learned that apparently it is illegal to be parked on the side of the road, despite the fact that the buses were not blocking traffic, were behind the yellow line on the shoulder or the road, and there were no signs saying “No Parking.” The commander said both drivers would be fined 1000 shekels each. This is about $250 which is about half a month’s salary for many people here. While all this “checking” and arguing was going on, I started to make some phone calls to Israeli and international human rights organizations because we could all see that this had the potential to turn into a disaster: 100 kids, 85 degree F weather (29 C), no water. But it is not “normal” to punish children like this and it is just plain harassment however you look at it. The army and the police could have let us go and just detained the one driver. We could have taken the kids down the road to get some water and finish the field trip. But no, everyone had to be detained. Many arguments with the police and the army ensued and we were on the phone with the Association for Civil Rights in Israel and Ta’ayush trying to get someone to help us to be released. Eventually Lina called the Red Cross to ask if they could bring us some water. The Red Cross was closed on Saturday (?!) but they promised to try to call someone else. After two hours of waiting I called the American Embassy in exasperation and explained that there were two American citizens detained in the middle of 85 degree weather with 100 Palestinian kids and some adult chaperons, no water and would they please intervene and help us all. Just as I was about to pass the phone to the police officer so the lady at the embassy could speak to him, we learned that we would be released. It had been two hours. time running around in the village, remarking in amazement that the people there are poorer than they are and live in caves with no electricity or running water. Explanation of the “Deleuzian” Israeli Occupation Forces (IOF) Strategy. The siege on ‘Ein Beit Al Ma’ refugee camp continued until noon on Friday, July 20, 2007 when the Israeli Occupation Force completely vacated the West Bank city of Nablus. International human rights activists who had been in the camp since 9:30am discovered a system of holes the IOF had blown through the walls of the refugee camp homes. The IOF destroyed walls of numerous homes, labeling the holes in order to allow soldiers to move through the refugee camp without entering the streets. This systematic tactic of collective punishment traumatized many of women and children who woke up to their homes being invaded and destroyed by the IOF. Internationals took still-photos of three homes connected by two partially demolished walls. They documented broken windows linked to holes in the walls of adjacent homes. When the IOF entered each of the homes, they immediately forced all those present into a single room and compelled them to stay there while their homes were occupied and used to link civilian homes in the military operation. Many homes had significant damage not only to their windows and walls but also to their personal affects. One woman told the international human rights activists that the IOF soldiers asked where her husband was. She told them that he was not home because he worked in Nablus Municipality. She said she asked them who they were looking for and they replied they were looking for everyone because everyone is Hamas. Another woman sobbed as she told an international human rights activist that 20 or more soldiers remained in her house for two hours. “They brought sandwiches. They destroyed my home and then they ate their lunch,” said she. “My children were so scared they hid under the bed in the room we were forced into.” The mother was allowed to leave the room in which her children hid only to serve water to the soldiers occupying her living room. After a standoff in ‘Ein Beit Al Ma’ refugee camp, Friday morning, July 20, 2007, in which six international human rights activists forced three jeeps of the Israeli Occupation Force to retreat, denying them further access to the camp, the international activists achieved a second success. At 11:30am several Israeli snipers were forced out of the home they had occupied since 3:00 am that morning. The internationals entered the house after the withdrawal of the snipers and found 35 civilians inside, 20 of which were children. International activists combed the main thoroughfare of ‘Ein Beit Al Ma’ refugee camp, Friday morning after the standoff, to ensure the army had vacated the area completely. Several Palestinian boys approached the activists to point out Israeli snipers in a building on the hill above the camp. The activists proceeded toward the building where they found the door of the gate kicked in. From the outside of the door they negotiated with the soldiers. “Your position is know you need to leave now,” one international activist shouted at the door. Several other activists echoed his sentiment. A soldier opened the door. “We are here to let you know that its time to leave,” said an activist as the soldier raise his gun to the activists’ chest. “There is absolutely no reason to point that gun at us and you know that.” At this time the activists could see several of the people being held prisoner in their own home. The soldier quickly shut the door when he realized everything was being caught on film. They shouted from the door to the soldiers that their location was known and that it was pointless to continue occupying the building. They implore the soldiers to leave and think of the families inside who they had endangered. The negotiations continued between the international activists and the occupying soldiers who whispered on the other side of the door. After about 20 minutes, the Israeli snipers did call the jeeps to return for them. Seven Israeli snipers exited the building. When the soldiers and jeeps left, the people trapped inside flooded out onto the street. They entered the house at 3:00 am, about 12-15 soldiers, and occupied the top floor, one man who had been held captive in his own home told the international activists. He continued saying that they made all the families stay downstairs. They separated the children from the adults. Two soldiers guarded the door to the building as well as the door to the room where they had forced the families to stay. The rest of the soldiers, he said, stayed upstairs. “My children were very afraid—they cried,” said one woman who was alone in her flat with her children because her husband, forced by the Israeli occupation and apartheid regime, sought employment abroad. “The Israeli occupation controls the whole country, what’s another house to them,” said another man about being held prisoner in his own home for 8 and half hours. One of the families inside the occupied house was visiting from Jordan for a wedding next week; they just arrived the day before. A woman in this family expressed deep sadness and shock over how quickly and drastically life changes in Palestine. No one was physically hurt during the house occupation nor were any of the families’ personal affects destroyed. One man told the international activists at the scene that he did not hear any gunfire coming from the third floor. 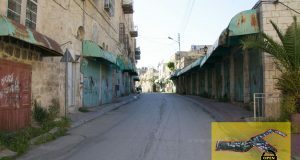 The invasion of ‘Ein Beit Al Ma’ refugee camp by the Israeli Occupation Forces (IOF) continued on Friday, July 20, 2007 at 10:20 am when several jeeps returned to the main street of Nablus and entered the camp. International human rights activists present created a human roadblock on the main thoroughfare of the camp to stop any other jeeps from entering the camp and continuing their siege on the camp’s inhabitants. Three internationals were shot with rubber bullets during the blockade. They were just three of the several victims of the IOF’s aggressive and excessive use of force that morning, on what could have otherwise been a quiet, peaceful and sunny Friday holiday. For approximately 40 minutes the activists stood and sat in the road denying the IOF access to the camp from that route. During the standoff between the jeeps and the non-violent activists, several sound bombs were thrown out of the jeep’s windows, tear gas was shot up into the air, and rubber bullets and sound bombs were fired at extremely close ranges. “They are not going through,” the activists echoed to each other making it clear that they were committed to staying in the road despite the IOF’s attempts to scare them away. The activists shouted to the jeeps, “Who are you shooting at?” The IOF continued to fire rubber bullets in the direction of the activists as well as at the Palestinian boys that lined the right-hand side of the road. “The ammunition in that gun will kill if you shoot it at this range. That is an M16 it will kill at this range. Do you understand, you will murder somebody if you shoot it. You will kill!” an international activist screamed at the jeep as it continued to fire its ammunition at the non-violent activists. Three jeeps were blocked from entering the camp by the activists, one on the offensive with two stacked behind it the second on the same road, and the third at the bottom on the main road perpendicular to the main thoroughfare of the camp. As the first jeep retreated and quickly approached, revving its engine each time it came within a half meter from the activists. “Does it look like we are moving? Back off! Back off!” said one of the international activists. They were undeterred, unintimidated, and unwilling to allow this vehicle as arm of the occupation apparatus access to the camp and its innocent inhabitants—the activists sat down together in the road. The jeep quickly sped up, stopping mere centimeters from the activists’ heads, which were then parallel to the bumper of the jeep, to rev its engine creating a dust cloud in their faces. The jeep continued its offensive hoping to scare the activists with its bullets, sound bombs, quick advances and loud engine. Many of the activists seized this opportunity to have a smoke while they sat in the sun showing the soldiers they were unimpressed with how they spent the United States’ Foreign Aid this year. After 40 minutes the IOF was forced to drive away. The international activists successfully warded off the threat of three more jeeps to the refugee camp. Not one soldier exited the jeep during the whole entire exercise. It was machine versus man on the streets of Nablus. Man, the human spirit, won that morning. Early in the morning Friday, July 20, 2007, the Israeli Occupation Forces (IOF) arrested three Palestinian men and injured three others during an invasion in ‘Ein Beit Al Ma’ refugee camp located in the north of the West Bank city of Nablus. According to several men living in ‘Ein Beit Al Ma’ the IOF entered the camp, shortly past midnight, raiding more than nine homes, terrorizing the women, children, and families as well as the community at large. At 9:30 am nine international activists approached the refugee camp. The roads were blocked; the IOF soldiers yelled from their jeeps that they could not enter the area. The activists continued to walk the streets of the camp undeterred by their threats. The nine walked to the main road at the edge of the camp where two IOF jeeps were blocking traffic on either side. Palestinian boys were victimized by the IOF fanatical anger and lack of control as they were shot at with rubber bullets and live ammunition from inside the IOF’s monstrous steel jeeps. At this time several international activists positioned themselves in between the gun sticking out of the IOF jeep and the Palestinian boys. The activists shouted questions at the soldiers about the necessity of shooting young teenagers as well as their illegal and unwanted presence in Nablus. Several activists took video footage of the event. After approximately 20 minutes, the soldiers in their fleet of jeeps left the city, not without first throwing a sound bomb out the door of their vehicle in close proximity to the medics and international activists. After the Israeli withdrawal, two internationals left the camp for Rafidia Hospital where the three injured teenagers saught emergency medical treatment. Mohammed Salim Askr, 17, was hit in the stomach/abdomen by a rubber bullet and underwent emergency investigative laparotomy. Edres Abdul Agfro Kama, 18, was hit in his right leg by a rubber bullet. He received surgery last year on the same leg for another rubber bullet injury. This time, he received IV antibiotics and discharged himself. Ali Esa Ramadan, 12, took a rubber bullet in his left hand. He did not have a fracture and was discharged. The Israeli siege on Zawata, a village near Nablus, continued around noon on Thursday, July 19, 2007 as Israeli Occupation Forces (IOF) demolished the exterior wall of a second home. The home itself was saved due to the extreme pressure placed on the IOF by international human rights activists present on the ground. The house belonged to Asad Natour’s three brothers. Faris Natour, 21, was interrogated inside his family’s half demolished home for almost six hours before he was arrested and taken away by the IOF. The IOF surrounded the house and they called the families out on the street. “They made them take off their clothes, all of their clothes one by one,” said Om Faris. The families were then strip-searched and forced to sit in the sun for two hours. Om Faris continued lamenting the events that transpired at her home that day. “I told them 18 people live in this house. We are still paying off the debts of this house. I started crying hysterically. Faris calmed me down and said I should leave. He told me: a house can be demolished and a house can be rebuilt,” she said. “Then they took the women up on the street. I refused to go. I told them if they are going to demolish my house they are going to do it with me in it. The house behind Om Faris’ home also fell prey to the IOF who had encircled the vicinity. Though the house was empty every window was shot in and shattered glass hemmed its interior. Osama Zawati, 50, was returning home from work in Nablus at 2:00 pm when he realized his neighbor’s home was under siege. He held two grocery bags of fruits and vegetables and was told by an IOF soldier to walk swiftly with them by his side straight to his home or he would be shot. Later, he tried to look at the damage to the windows of his neighbor’s home, however, the IOF did not permit him to do so. Around the same time, the IOF shot rubber bullets at an ambulance parked a quarter kilometer from the home still being occupied. The ambulance was parked outside a home where medics and internationals waited, after being denied access to the home, for Faris to be released and the army to leave the village. At 5:00 pm, less than three hours later, the Israeli army occupied the house of Nowaf Abu Amsha, 35, in which the internationals and medics had been waiting, and the family was dragged out into the street. The army then demolished the family’s nearby garage with their car inside. “They didn’t ask me even to open it,” said Abu Amsha. At 6:00pm the IOF left the village, two young men from Zawata still in their custody. Their mothers left to wonder when, if ever, they would see their sons again. “On average 12 innocent people lose their home for every person ‘punished’ for a security offense – and in half of the cases the occupants had nothing whatsoever to do with the acts in question,” reads the ICHAD website. “To add to the Kafkaesque nature of this policy, the Israeli government insists it is pursued to ‘deter’ potential terrorists, although 79% of the suspected offenders were either dead or in detention at the time of the demolition.” (B’tselem Summary 2004:1,3). Anyone who has traveled through Ben Gurion airport in Israel knows that it is a unique experience. For most Israeli Jews, the experience is comforting, a quick and accommodating entry into a nation created and developed for the Jewish people. For Palestinian-Americans and many activists working in occupied Palestine it is quite a different experience. Most of these travelers are held for hours and questioned repeatedly; some of who are stripped naked and in some cases (especially in the last two years) denied entry. As I write from Ramallah, I recall my and my brother’s experience in Ben Gurion just one week ago. After a sleepless 15 hour trip from New York, we arrived at the airport and went directly to the check-in booth. After waiting in a short line, a friendly woman asked for our passports, yet immediately turned sour once she viewed them. We were asked to step aside and after about 15 minutes a woman from airport security told us to follow her into one of the detainment rooms. Given the countless stories of harassment I had heard and read about before my trip, I wasn’t so foolish to think that my journey through Ben Gurion would be a walk in the park. I had initially anticipated a four hour wait, interrogation, and a thorough pat down by Israel’s finest. When we arrived at the first detainment room, several young female security agents asked us where we were going, about our ethnic background and family history, whether we had family in Israel or the occupied territories (and if we would be staying with them), and if “there was anything they should know.” We were then taken to another detainment room, where a few other detainees were being held. Over the next three hours, several female security officers came into the detainment room we were being held in to question us, while at other times we were called into other detainment rooms for questioning. One African detainee, an elderly black woman, was not allowed into the country with her husband despite a seemingly innocent decision to visit her family. After about four hours, pure exhaustion set in. At this time, we were taken to a large room with metal detectors, an x-ray machine and a coffee machine that looked like it wasn’t in use. Still, in a token attempt at friendliness, the security agent offered us a cup of coffee. But the offer was rescinded once he noted the machine was out of service. About every ten minutes another member of airport security entered the room. After about 30 minutes we were taken into a back room, patted down, and scanned with a hand held metal detector. After being held for an hour, Sami, who claimed to be a higher up in the IDF and airport security, entered the room. He had apparently been called in by regular airport security because of certain “red flags” we had raised. Sami didn’t look particularly happy to see us. He started to go through our bags, which had been checked by every member of airport security that previously entered the room. He had a determined look on his face as he sifted through my brother’s book on corporate law and became more agitated when he didn’t find the holy grail of information. After about 15 minutes Sami looked up at us and told us that “something was missing;” we were “leaving out part of the story,” and he was going to find out just exactly what that “part” was. He was looking for what he called the “truth.” So I repeated what we had told the previous soldiers: we were staying our first two nights in East Jerusalem, we would be traveling to the holy sites (to see where baby Jesus was born), Haifa and Yaffa (the cities our grandparents were dispossessed from in 1948), Nazareth and Bethlehem. We told the truth, but kindly omitted Ramallah, Nablus, Hebron, Jenin, Dheisheh, and any other intended stops in the occupied territories that didn’t involve conventional tourism. In all honesty, we had only planned out our first two days in East Jerusalem, which made Sami increasingly annoyed. Sami put it bluntly, as of the moment we were called in we were considered “terrorists” or people intending to “engage in terrorists activities” because we “lied” to airport security about the intention of our travels. Sami defined terrorism and terrorist activities as meeting up with the International Solidarity Movement (ISM), working in “terrorist” branches of the Alternative Information Center (AIC), and non-violently protesting against the Apartheid Wall in the village of Bil’in. He was trying to a strike fear in us that went well passed being denied entry. It had become a matter of whether he was going to tell the US government if we were terrorists or not. He claimed that if he told the US government we were terrorists, it would not only affect us the rest of our lives (i.e. anytime we tried to get a job, bought a plane ticket, or applied for a credit card), but it would affect our family, immediate and extended, in a similar fashion. The explanation was clear: nobody would believe two Palestinians males over a respected man in the IDF with 40 years of experience. At this point I started to offer up information that may or may have not been considered “terrorist activity,” essentially the plans for our trip, which my brother and I were still faintly excited about, plans that didn’t seem to bring much joy to Sami. Sami started to go through our phones, writing down numbers and asking questions about anyone with an Arab, Persian or Jewish name. He was particularly angered when he saw the name of a well known Jewish activist who had done extensive work in the occupied territories in my brother’s phone. Ironically, the number in my brother’s phone was the number of a paralegal in New York City, not the well-known activist, but Sami wouldn’t get off the subject for a solid half hour. After about 90 minutes of intense bullying, Sami concluded we weren’t terrorists. At this point, good old Sami started to warm up, but not without first telling us what we explicitly weren’t supposed to do: no ISM, stay away from AIC activity, and do not engage in anything that we would categorize as non-violent activism. By the end of stay at Ben Gurion, Sami informed us that we were lucky to catch him on a good day. He became extremely open and candid in the last 30 minutes. He said that he may not agree with everything that he does and he may not agree with the political situation, but he’s a soldier of the state, and serving its interest is his job. While I appreciated his honesty, this type of rationalization has been used throughout history, justifying war crimes and human rights violations ad infinitum. As our seven hour journey came to an end, Sami began telling us personal stories. I’m not sure if it was an attempt clear his conscience, but he told us about his diverse group of friends, which included Arabs, and how his life had been saved five times, all by Arabs. It was amazing to see how human and forthcoming some of the “toughest” people in Israel have become, while at the same time keeping up their walls of discrimination and oppression, walls that have ultimately been encompassed by a greater wall of rationalization. For us, it was seven hours of hell in Ben Gurion. For a Palestinian here, occupation is a reality every day of the year. Remi Kanazi is a Palestinian-American poet and writer based in New York City. He is the co-founder of remroum@gmail.com. Friday’s non-violent protest saw over 300 Israeli (~25), Palestinian, and international (over 100) supporters walk, unarmed as usual, from central Bil’in village towards the Israeli Apartheid Wall, which steals nearly 60% of Bil’in villagers’ vital agricultural land. Despite numerous attempts by the Israeli Occupation Forces (IOF) at squashing the marchers demonstration, protesters re-grouped repeatedly to continue to march on Palestinian land towards the Apartheid Wall, also on and dividing Palestinian land. Marching forward, they faced repeated firing of tear gas, sound bombs, rubber and live bullets. At least 7 were injured, including regular Palestinian activist from Bil’in, Ibrahim Bournat, who was hit in the head near his eye with a rubber-coated steel bullet, resulting in a significant loss of blood, and long-time Israeli activist Jonathon Pollack, who was wounded in the arm. Wheelchair-bound, another regular Bil’in activist was hit by a tear gas canister which rebounded, landing in his lap clouding him with dangerous amounts of debilitating tear gas at close range. Paralyzed in one hand, he was able to flick away the hazardous canister but suffered further as a second rolled towards him. The excessive firing of tear gas at the peaceful protesters inevitably results in numerous fires among the olive trees, as was the case today with at least 3 potentially serious fires and other smaller flames breaking out. Marchers rushed to extinguish the flames, using branches and their feet to beat and smother flames before they spread. Due to winds, lack of water, and the chaos of the situation, it is common for these fires to quickly escalate and burn the many olive trees spread across the arid land belonging to Bil’in villagers. In spite of having been assaulted repeatedly with seriously debilitating tear gas, sound bombs and bullets, protesters persevered, again and again making efforts to walk on the land being held hostage by the IOF, using such non-violent tactics as singing, sit-ins, walking with arms raised to indicate they held no weapons and attempting dialog with the attacking IOF soldiers. In stark contrast to recent CNN reporting on Bil’in weekly protests, it is worth highlighting the number of Palestinian and Israeli participants, as well as dedicated regular international supporters, old and young, who convene out of moral obligation and objection to this Wall and the Occupation. July 19th, 2007. This afternoon, on Shuhada Street, a young Palestinian boy was detained. Two settler children were coming up the street, drawing on the doors and walls of Palestinian houses with chalk. Two ISM members were posted on the street and one of them informed the police of the settlers actions, to which he was told that it was just a kid’s game. Shortly after, a police car passed in front of the children, stopped, and said something to them. The car then stopped in front of the ISM members and informed them that he had already advised the children to cease drawing. The settler children passed along the street and some minutes later, returned followed by two Palestinian teenagers, walking about four meters behind them. 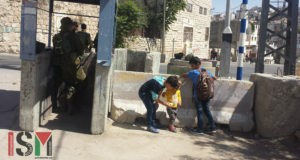 The ISM members could see one of the Palestinian teenagers saying something to one of the settler children and were later informed by Temporary International Presence in Hebron (TIPH) who had spoken to the second Palestinian teenager that his friend was responding to a remark made by the settler children. Immediately after, the children went to the police and spoke with them. The police then stopped the Palestinian teenager who had spoken to the settler children at 15.35. Five minutes later, one of the ISM members asked the police what the problem was, but was told that it wasn’t her business but an issue for the police. He refused to give any further explanation and asked the ISM member to wait away from the area in which he was detaining the Palestinian teenager. At approximately 13.50, another two ISM’ers joined the international group observing the situation. At 14.05, the Palestinian teenager was put into the police car and one female ISM’er approached the police man again, asking for a reason as to why he was being taken to the police station. She was told that he didn’t have any identification on him and the police man refused to let her speak to the teenager. The teenager was then driven to the local police station where he gave a declaration of the facts and was released approximately one hour later. This shows, once again, the different approaches used by the police in Hebron, especially in Tel Rumeida, depending on each person. The settler children can throw stones, intimidate and terrorize the Palestinians and yet, they are never detained. Meanwhile Palestinian children must go to the police station simply for verbally responding to the provocation, intimidation and harassment they experience on a daily basis. July 17th, 2007. The below report was written by Summer Camp participant: P.R. The decision was made. We as the summer camp now officially have two houses to reconstruct. We all woke up this morning with a day of brick setting and cement pouring ahead of us. Some of us woke to the sound of mosquitoes in our ears, others to the splash of cold dew dripping down from the tent tarp between their noses. We moved on to the building site after breakfast and did exactly what we were meant to; Setting bricks into walls. But before we could pour the cement Meir received a phone call and asked if we’d like to accompany him to see a demolition in Jerusalem. Many of us went with him and as we watched the green army jeeps leave the Israeli base we realized that they were headed toward Anata. It was quite a scare. I myself was in the van where people feared that the demolition team was coming to destroy our in-progress home. Back at camp however, the family panicked and some tears were shed in the thought of once again losing their house. The workers had already abandoned the site by the time we had arrived. Meir clarified that our house was not in danger of demolition but the house just down the hill was about to be torn down. He warned us not to approach the demolition site as to avoid attracting attention to our project. We all climbed to the upper floors of a large apartment building and watched as the bulldozer inched toward the little house. Soldiers surrounded the entire house and even went as far as placing soldiers amongst the crowds of Palestinians and internationals watching on the hillsides. Watching the demolition really made me question my own opinions. I don’t consider myself an optimist, but I know that there is a considerable amount of Israeli’s who do oppose this government and its policies. I believe in the good of men. It is moments and atrocities like the one that I witnessed today that make me doubt my own beliefs. We all stood on the balcony, some of us filming, some of us taking pictures and a lot of us discussing. But all of us had the same feeling of disbelief and hopelessness. For a single moment I thought that many of us in this camp lost our sense of hope. When I finally went down and closer to the house and the soldiers, I continued to watch. Some of the Palestinian kids were staring at the soldiers. One of the soldiers asked in Hebrew “What are you looking at?” and approached the child. The kid’s older brother took to his defense and the soldier told him to shut up. I guess it never escalated because of our presence as foreigners. But it was appalling for me to see people just a year or two older than me seem so heartless. I never was keen on the draft, and this reminded me why. The soldiers left and we saw the children throw their stones and down came the tear gas canisters. We left to avoid getting caught in the crossfire. Jeff Halper had returned from the United States and when we got back to Beit Arabiya he, Salim and Meir debriefed us about the whole event. Why the house was demolished and the events that led up to it. The family was not even home, but they have to come back to a pile of rubble. We decided as a whole to continue both our current project and give hope to the newly distressed by also reconstructing their home. And so the decision was made that this year, we will have two homes to dedicate, two hopes to restore, and two families to rebuild. On Tuesday, 17 July 2007, Sanaa’ Ahmed ‘Ali Shanan, 29, from the northern Gaza Strip town of Jablaya, married to Jamal Saleem Shalha and a mother of 3 children the youngest of whom is 6-month-old, died at an Egyptian hospital. She had been stuck in Egypt for at least 35 days. According to her brother, she was transferred by the Palestinian Ministry of Health to Nasser Institute Hospital in Cairo nearly 2 months ago to undergo medical checking for her chest. The medical checking concluded that she was suffering from pulmonary fibrosis. She had remained in the hospital from 10 days, before she traveled towards Rafah International Crossing Point to go back to the Gaza Strip. As the crossing point was closed, she was forced to go to al-’Areesh town, waiting for the crossing point to be opened. She went more than once to the crossing point, and she had to spend more than one night near it. She then stayed in the Egyptian town of Rafah, where she stayed with her uncle. During her stay in Rafah, on Monday, 16 July 2007, her health condition deteriorated. She was evacuated to the hospital, but she died at approximately 11:00 on Tuesday. Her body has been kept at the hospital pending the approval of Israeli authorities to be allowed into the Gaza Strip. Thus, the number of Palestinians stuck in Egypt who died has increased to 16, most of them are patients who had received medical treatment at Egyptian hospitals and their health conditions deteriorated due to long waiting under inhuman conditions at the crossing point. Two other Palestinians also died in a car accident while they were on their way to the crossing point. IOF have refused to allow the entry of the bodies of the deceased through Rafah International Crossing Point, and have allowed their delayed entry through Karm Abu Salem (Kerem Shalom) crossing. arrived in Egypt to travel to the Gaza Strip to visit their relatives, and hundreds of university students who wish to spend their summer vacation with their families in the Gaza Strip. Many of these Palestinians have run out of money due to their unexpected long stay in Egypt, and they are threatened by diseases due to the lack of basic sanitation services. Additionally, the Egyptian Authorities have continued to hold hundreds of Palestinians at al-’Areesh Airport, nearly 50 kilometers away from the crossing point, worried of their possible long stay in Egypt due to the closure of the crossing point. PCHR is deeply concerned over the deteriorating humanitarian conditions of Palestinians stuck at Rafah International Crossing Point and neighboring Egyptian towns. PCHR is shocked by the failure of the international community and United Nations agencies to act to end the suffering of these Palestinians through pressurizing towards the opening of the crossing point. The closure of border crossings of the Gaza Strip, especially Rafah International Crossing Point, and the restrictions imposed by IOF on the freedom of movement of the Palestinian civilian population constitute a flagrant violation of international humanitarian law, especially the Fourth Geneva Convention of 1949. 1) PCHR calls upon the international community, particularly the High Contracting Parties to the Fourth Geneva Convention, to immediately intervene and exert pressure to ensure the reopening of Rafah International Crossing Point in order to end the suffering of thousands of Palestinian who have been stuck at the crossing point. 2) PCHR calls upon the international community to take necessary stop to compel Israel to stop the policy of collective punishment practiced against the Palestinian civilian population in the Gaza Strip, manifested in the closure of all border crossing and the restricted movement of persons and goods. I am an Israeli citizen and have never been to the West Bank before, but this morning I woke up in the West Bank, along with 25 strangers, with the goal of accomplishing something that I consider moral while my government considers illegal. Personally, I believe that people should abide by their morals, and this is what makes this trip worthwhile for me. After breakfast, a team from ISM came to explain what we are to do if a situation arises where we come face-to-face with an IDF demolition team. We later toured Anata and visited the leader of the local Bedouin tribe – Abu Mussa. He explained the hardships of being exiled from place to place and how the lack of health benefits in Anata led to the amputation of both of his legs. He told us about how his family was not allowed to visit him in the hospital after his operation and he also told us about his dreams: how he wants one day to return to his homeland and his tribe will be once again united. He and his family would then have a definite place they call home. Hearing his story and seeing his condition saddened me, but his will to survive inspired me. As an Israeli, it is especially difficult to see just how terrible conditions are just a few miles from home. It’s a disappointing site to see, that really makes me question a government that I already have little faith in. We made our way to the building site after the tours. The house’s foundation was already in place because ICAHD had started this particular house last year, but the building process was interrupted by the IDF. The now not-so-strangers and I constructed a human chain to transfer bricks from one level of the house to the other. The work was difficult, but it’s not something I will remember because the chemistry between the team and the group of Palestinians helping with building the house was exceptional. Despite the language barrier, we managed to cooperate and I believe we accomplished a considerable amount. I was later surprised because at the time it did not occur to me that the people around me were from Switzerland, Italy, the United States, the United Kingdom, and Palestine. To me, they were simply people – one and the same. That is what I will remember at the end of all this. We were a group of people from all over the world, but still – just people helping people. Written by Summer Camp Participant: P.R. Day two of the summer camp, the first full day of work on the building site. Another great breakfast followed by the short walk to the building site. Today the ICAHD volunteers engaged with a variety of work – mixing cement mortar, helping to lay blocks for the walls, arranging the hollow blocks for the roof structure and tying the reinforcing bars for the concrete roof beams. Above all, the work day was characterized by the forming of human chains. Chains to remove rubbish, to move concrete blocks, to carry buckets of cement mortar and to move steel reinforcing bars. There is quite a lot involved in forming such a chain. Everything becomes meaningful, from the way people position themselves in relation to each other to the way they pass the buckets or blocks to each other. The chain can often be the first time people meet and talk to each other. Discussions about where people come from and how and why they came to be here. This human chain is a reminder of the long line of events and causes that brought all these people to this particular building site. And it is also a way to express and demonstrate concern for the wider cause. The camp was joined by volunteers from ISM who helped on the building site for the day. At mid-morning a press conference was arranged with powerful statements given by ICAHD members, and volunteers and also by the family whose house we are building. In the afternoon the site was visited by a group led by the Consul General of Belgium Mr Leo Peeters. He was taken on a tour of the area and shown the wall around Anata. He expressed solidarity with the work of ICAHD and commended the building work on site. In the evening, excellent discussions were led by Machsom Watch and the Coalition of Women for peace. The speaker from Machsom Watch talked about the system of checkpoints and the presence of women at checkpoints – ‘opening a window into an ugly back yard’. They showed the way that the Civil Administration acts as the bureaucratic arm of the occupation. Machsom Watch is concerned about what is happening to the country and the society and attempt to set up a challenge to the dominant military discourse of Israeli society. Written by Summer Camp Participant: T.M. July 17th, 2007. At around 8pm an ISM activist in the Hebron area was informed of a fire on Shuhada street, next to the Beit Haddasa settlement. When fellow ISM’ers reached the house it was clear that it was burning inside because a lot of black smoke was coming through the windows. A few minutes later a police car arrived. The ISM’ers tried to have the police call the firefighters, something which they showed no interest in doing. The Police said that since no flames were seen no fire fighters were needed, they did not enter the house and did not look through the windows which would have clearly indicated that there was a fire. Many Palestinians from the neighborhood did call the fire fighters, but the fire truck was not let through by Israeli Occupation Forces. A little later another police car arrived. The ISM’ers were asked for their passports and informed that they could be accused of trespassing and arson, the arson accusation would, of course, somehow be for a fire that didn’t exist or, if it did exist, merit calling the fire department for. July 17th, 2007. At around 1pm at Issa Amro’s house in Tel Rumeida, two people from the ISM got detained by police after a settler incident. While three people from the ISM were monitoring the house, they noticed a settler, around his mid 20’s named David, sneaking around the house, circling the property and eventually trying to enter the property. Soldiers were observing the situation but did not intervene until the settler entered the barbwire surrounded area at which point the ISM team told him to leave the privately owned Palestinian property. After leaving for a short while he and an older settler returned, along with soldiers and shortly after followed by a police man. The settler accused one of the members of ISM of obstruction of public order and another of assault. They were both taken to the police office in Kiryat Arba. After a couple hours of “investigation” one activist was released and another was bullied into signing an agreement not to return to Hebron for two weeks. Hey, you are the Black Death! Monday July 16th, 2007. Four members of the ISM have taken part in a work camp in Anata (Jerusalem area), organized by ICAHD, with the support of other organizations. The goal of this summer work camp is to rebuild a house demolished by the Israeli Occupation Forces in December 2005. 25 internationals from the US, New Zealand, Italy, England, and many other countries, as well as a variable number of Israeli volunteers, who go for one or some days, have taken part in this camp, that started on the 14th of July and will finish on the 28th with the inauguration of the house, hopefully, completely finished. The construction of the house is paid for by the internationals, who pay $1000, apart from their physical contribution with their work to build the house, hand by hand with Palestinian workers. Tours are also given during part of the days, all around West Bank. The Palestinian family whose home is being rebuilt are staying in another nearby house, which sits in front of a new interrogation center and which, was itself demolished four different times and rebuilt by the ICAHD four different times. Nowadays this house doesn’t function just as a home, but as a Peace center, because the family lost their residence permit and can only be there when there is an international presence with them, as it happens at the moment. The coordinators of the camp explained to us that the Jerusalem budget for demolishing houses allows only for 100 houses a year, but every year they plan for the demolition of many more families homes and in this way nobody knows when, or even if, their house is going to be demolished. This regularly makes them wonder why their house has been demolished while their neighborer’s, which was scheduled for demolition, wasn’t. The demolition orders come because most of the houses in West Bank are “illegally” built and that is because it is almost impossible for Palestinians to build their homes legally. Each time they apply for a permit, they have to pay about $5000, and many times they have to apply three times. Even after three attempts sometimes they are still unable to get a permit. The Israeli authorities generally make up different excuses such as, that the house is on a hill, that a document is missing or some other meaningless bureaucratic nonsense. This process can be 10 years long. In Anata’s case, the situation is even worse. Anata is a village under three different authorities: Jerusalem municipality, Area B (Palestinian civil control and Israeli military control) and Area C (Israeli civil and military control). So people here have to appeal to all these authorities. The Israeli project for Anata is to surround it by the wall, with just two exits, one to East Jerusalem and the other one to the rest of the West Bank. Both international and Israeli volunteers were very excited to help rebuild this home. The contact with other people from all over the world, all of whom have the same goal and the same worries about the situation in Palestine, along with the shared sweat, conversation and smiles with the Palestinian people makes everyone feel very hopeful about the future here. For many Israelis, the West Bank is as unknown to them as it is to people coming from other countries. Living and sharing this reality will help to give them a different idea of the situation in the country they share. Starting on monday July 9th, 2007, ISM volunteers joined skilled Palestinian workers and international volunteers from EAPPI (Ecumenical Accompaniment Programme in Palestine and Israel) and Holy Land Trust, in coordination with ICAHD (Israeli Committee Against House Demolitions) in rebuilding a house in Al Walaja vilage that had been demolished by the Israeli Occupation Forces. Al Walaja Village is now located 8 kilometers west of Bethlehem, and has 65 houses and one mosque slated for demolition, though the location of the village has changed over the years according to the whim of Israel. When the Israeli State formed in 1948 the village was moved from the Jerusalem hills (where it had been located for more than a hundred years) to a nearby location reduced from its original size by 90%. By 1967 half of the village had left, half remained. State harassment continued; in the 1970s, Israel limited building permits for Al Walaja villagers. In 1981 Israel issued orders to annex the village into the Jerusalem municipality, to become Israeli public land, but did not provide services or rights to the people living there that were normally accorded to Jerusalem residents; villagers received orange ID cards instead of blue as a tactic to drive them away. This has taken its toll. Villagers now must be over 40 to obtain a work permit as a laborer in Israel, unemployment is high and many people leave to the UAE to find work. Those that stay are faced with a landscape increasingly surrounded by settlements, of which Har Gilo is the closest. The Israeli government has planned to build the apartheid wall entirely around Al Walaja, so that it is surrounded, with one entrance. A village of 2000 people surrounded by a wall and illegal settlements, with little chance to work, and houses slated for demolition. It is not a pretty picture. When volunteers from ISM joined the building of the house of Monder and Seham Salem, what struck us was their brave face of resistance in front of all this repression, but what also struck us was their story. Their house, the house they built with their own money, was first demolished in January of 2006, they were told they didn’t have a permit. After having their house demolished without any warning they were forced to live in a tent in the winter for two months. They rebuilt their house after this with money pooled from the local villagers, and tried to get a permit, but after it was built it was demolished again in December 2006 because they were told the apartheid wall was due to cross their property. Again, they were not given any warning. Their family had owned this property since before 1948. They were fined 100,000 NIS because of ‘illegal building’, which they refused to pay. Because of their inability to pay this fine, the father, Monder, was imprisoned for one month, also their oldest son was arrested and kept in prison but for a night but released due to his young age. To rebuild their house to half the size after the demolitions it has cost in total around $35,000. This time their house, the third to stand on the property, was paid with money from ICAHD and Holy Land Trust. In a village of similar stories, we spoke to a nearby neighbor who has spent $76,000 dollars on court fees to Israel over 12 years for Israeli surveyors to measure his land, for Israeli workers to fly to Turkey to verify his land claims from the Ottoman empire. While we were there this neighbor happily showed various documents, some from the British mandate, showing that his family had owned this land. Amazingly it took only two weeks for spirited volunteers and Palestinians to put foot to sand and hand to brick and put this house back together. Some days there were as many as 30 and 40 people from many different countries that only wanted to do their best to work with people that were committed to not doing the easy thing, not leaving to another country without illegal settlements and so much institutional racism, but to stay on the land that their grandfather owned, to stay and struggle for justice. The people that live in Al Walaja will be completely isolated from other villages like Bethlehem and Bet Jalla by Bypass road 60 and the wall for the fault of Israeli policy of confiscating land and driving out the original inhabitants. One man has to keep his chickens in a van because he is not allowed to build even a chicken coop, the people are not allowed to build anything as a way to falsely prove that Israel is stealing a land without a people. After working for a week side by side with the family, with Palestinian workers, with international volunteers, on Saturday, June 14th, there was a ceremony, a kind of ribbon cutting for the house. The family spoke of their gratitude for their new house. The volunteers spoke of their gratitude for meeting the family and the opportunity to do something. Two olive trees were planted on the property from Holy Land Trust and the local popular committee as a symbol of Palestinian commitment to their land. But their commitment was not only symbolic, the brother of Seham Salem, who had helped her rebuild her house every time, and worked tirelessly making sure the house was built right, said he also would commit himself to helping rebuild houses demolished by the Israelis as a volunteer. ICAHD also committed themselves to rebuilding houses demolished by the Israeli occupying army. More than 18,000 homes have been demolished since 1967, more than 18,000 families have been kicked out without warning. ICAHD said they had rebuilt 40 already this summer, with the goal of 300 rebuilt by the end of the year. Clearly the work is not over. It is easy for people with foreign passports to work some days of manual labor and leave for foreign shores. It is the people who have had their house taken from them, destroyed, that must live with it. But we are not standing idly by. The work we did was important, but far more important was meeting the family, and families of the region, listening to their stories, and repeating them to all who will listen. These families prove there is no irresistible force that can stand up to an immovable object.